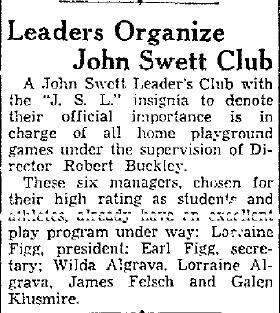 While going through the Oakland Tribune Newspaper [Oakland, CA] dated 17 Sep 1933, I found this little article about the John Swett Leader’s Club. John Swett was born in 1830 and died in 1913. He was the California State Superintendent of Schools from 1863 to 1867. He is considered to be the founder of California public schools. The John Swett Leader’s Club was named in his honor. The names in this club were of interest to me as three of them are related. Lorraine Figg, Earl Figg, Lorraine Algrava, and Wilda Algrava, were all children of my Grandfather’s cousins. Lorraine and Earl were the children of Sophie (Pacheco) and Albert Figg. Wilda was the daughter of Manoel and Delores Pacheco (later Algarva–not Algrava). Lorraine was the daughter of Antonio and Georgina (Medeiros) Pacheco (later Algrava, Algarva, and other spellings of your choosing). I wish I knew what school this was from. Lorraine Figg is the oldest of the relatives mentioned. She’s 11. So, this is an elementary school. I wonder what was involved in keeping track of “playground games”? It sounds like when I was in elementary school and we had our student body. I was a class representative a couple of times. We had Kool Aid and Bake Sales so that we could buy balls for recess and other stuff that was important to us kids. It’s interesting to see these children taking on leadership posts in school. Their parents were all born in Hawaii and were new residents of the San Francisco Bay Area. The Figgs were a military family and had been stationed in Missouri three years earlier. It’s fun to see that community news items were a part of the everyday newspaper. We don’t get this kind of local news today in the Oakland Tribune.